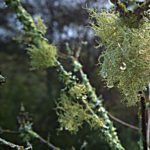 Azalea and Ash Tree: lichen or fungus? My azaleas are suffering with what appears to be lichen. I have tried cutting off the affected branches but more are affected. The adjacent ash tree also has branches affected similarly but still sprouts leaves. Please advise me what to do. Photo attached.